If you are unfamiliar with the principle of distributed computing, please check out Stanford's Folding Website here. Protein Folding helps researchers discover treatments and cures for diseases as they understand more how proteins work. It's a good cause, and it's easy to help. Installation is a snap. Just download the appropriate version below and in the case of Windows users, simply double click to run the installer. When you fill out the information, please make sure that you enter 33009 as your team number. That way you'll be counted on Team BCC! Also, you may want to add BCC| in front of your username, (eg. BCC|Zeus) so that you will have a unique user name. Otherwise you may end up using someone else's user name! Thanks for joining and helping make the world a better place by curing disease! The latest software is available over at the FAH Download page here . 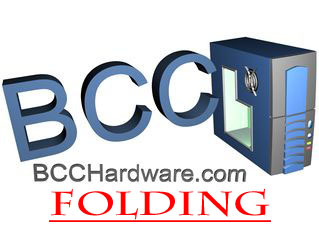 Thanks for helping the world and BCCHardware!